This time last year I commented that the changes in lending rules in the Spring were likely to lead to a flurry of activity before the changes were followed by a lull. The question was whether activity would recover its pace in the Autumn. I suggested that Autumn would be quieter and in the end that’s pretty much what happened. 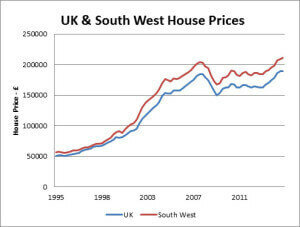 Annual house price growth peaked in Q2 of 2014 at 11.5% nationwide and 9.8% in the South West. Since then the rate of growth has declined to 8.3% pa and 8% pa respectively – growth certainly, but perfectly sustainable. Graph reproduced with the permission of The Nationwide Building Society. © 2015 The Nationwide Building Society. All rights reserved. During 2014, house prices climbed above the previous record levels of 2007 – pre-recession – but overall the rate of growth in 2014 was steady rather than spectacular. The risk of “over heating” is really a reflection of the sentiment behind a rate of growth that is too steep to be sustainable and the latest data from the Nationwide survey doesn’t suggest the curve is that steep. External factors could change that, of course, but a dramatic correction seems unlikely. Interestingly, the predictions by a range of experts, quoted by the BBC at the beginning of this month, are for a rise in 2015 of between 3% and 5% with 4% being a near consensus. This same group of experts predicted a much wider range of 4% to 8% growth in 2014. The actual growth in 4th Qtr 2014 was 1.1% so effectively they are predicting 4 quarters in 2015 at that sort of level. There are some interesting forces coming into play in 2015 that will determine whether these predictions are correct. The first is the relaxation in pension regulations. By permitting much higher levels of withdrawal in cash it is likely that significant additional funds will move into property. The British do like to buy property. The other factors are interest rates and oil prices. Personally, I think the rate rise is getting pushed further into the future whilst oil prices stay low. The plunging price of oil will keep inflation low and make increases in interest rates more difficult to justify. The predictions are now that as many as 13 European countries could see negative inflation in 2015. Even if rates do rise, a ¼% rise would take £20/month out of a typical household budget. The lower fuel prices put that back just with the direct cost of running the average family car, let alone the knock on savings with delivery costs and household heating. My conclusion is that whilst quarterly growth of around 1% is likely for the first 3 to 6 months, it is likely to be higher than that in the 2nd half of the year. I think annual growth in excess of 5% is more likely.